The left arm plays an important role in keeping the golf club in the proper position during the back swing and down through impact. Keeping the left arm straight during this portion of the swing presents difficult for some golfers, but working with a couple basic drills can help correct the problem and lead to more consistent, solid ball-striking. 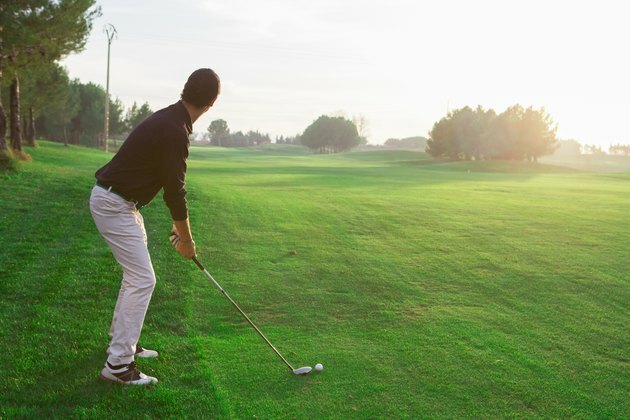 PGA professional Mark Blakemore points out that the most common cause of a left arm that becomes bent before contact with the ball is arms and hands continuing to wrap around the torso in the back swing after the shoulders have stopped rotating. In such an instance, it's virtually impossible to keep the left arm straight. This flaw typically shows up in players who are over-swinging -- trying to hit the ball harder with extra arm action. Blakemore recommends a drill that involves taking various positions in the back swing while standing in front of a full-length mirror. Begin by standing up straight, facing the mirror with your arms extended in front of you and the club shaft pointing up. Keep your eyes and face pointed at the mirror as you turn your shoulders as close to a full back swing rotation as possible. Your arms should turn with your torso in this move with your left arm finishing straight and parallel to the ground. From this point, tilt your spine slightly forward and lift your arms slightly to match the optimal takeaway position. Ben Hogan advocates practicing maintaining a straight left arm by imagining your elbows bound close together by rope or rubber bands through the back swing and into impact. The right elbow must bend during the takeaway, but the image of elbows connected will enable you to maintain the straight left arm. Keep the elbows close together through contact with the ball where the left arm will begin to fold and the right arm will straighten for the proper finish. Blakemore concedes that some golfers may have physical limitations preventing a straight left arm through the back swing and into impact. He points out that the critical moment for a straight left arm is when the club head makes contact with the ball. Consequently, if you find that you are unable to maintain a straight left arm as prescribed in these drills, consider consulting a teaching professional to see how to make the most of your unique situation for left arm stability.